The Vasa warship in Stockholm (Sweden) illuminated in green as part of Tourism Irelands Global Greening initiative. 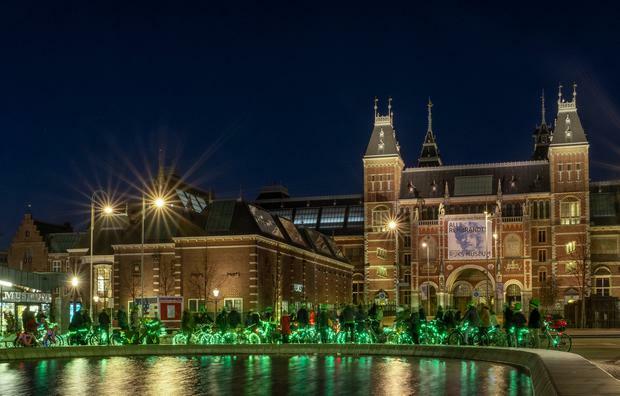 St Patricks Bike Parade at the Rijksmuseum in Amsterdam – a festive green procession of bicycles, with the bike wheels illuminated with green LED lights, as part of Tourism Irelands Global Greening initiative. The TV Tower in Tbilisi (Georgia) joins Tourism Irelands Global Greening initiative, to celebrate the island of Ireland and St Patrick. Council House in Perth (Australia) illuminated in green as part of Tourism Irelands Global Greening initiative. The Cotton Tree in Freetown, Sierra Leone – where freed slaves gathered on their return to Africa after the abolition of slavery – illuminated in green as part of Tourism Irelands Global Greening initiative. The Source of the Nile Bridge in Uganda, illuminated in green as part of Tourism Irelands Global Greening initiative. Gate of the Citadel, Montevideo (Uruguay), illuminated in green as part of Tourism Irelands Global Greening initiative, to celebrate the island of Ireland and St Patrick. What have the world's tallest building, Niagara Falls, Adare Manor and Finland's sub-zero take on Dragon's Den got in common? All are among some 450 global landmarks, buildings and events going green this weekend in a burst of colour worth over €10 million to Irish tourism. That's according to Tourism Ireland, whose 'Global Greening' initiative is rolling out to some 55 counties in this – its tenth, and biggest ever, year. New 'greenings' for 2019 include Dubai's Burj Khalifa – the world's tallest building at 828m – Victoria Falls, and Cornwall's Eden Project. They join old favourites like the Sydney Opera House, Sleeping Beauty Castle at Disneyland Paris and the Las Vegas welcome sign, in an initiative seeking to capitalise on international goodwill surrounding St Patrick's Day. It's aim? To encourage people to visit the island of Ireland. The Global Greening is an expression "of our reach, our shared values and our ambition," in the words of An Taoiseach, Leo Varadkar, who recently launched a book telling its story – Ireland's Greening of the World. "It's impossible to put an accurate figure on [the marketing value], but it's worth a minimum of €10 million," adds Tourism Ireland CEO, Niall Gibbons. And the cost? €48,000, the marketing organisation says. Quirkier inclusions this year are a parade of bicycles in Amsterdam and Pari Roller – the world's biggest rollerskating event, which takes place every Friday night in Paris. In Finland, a wacky version of Dragon's Den called Polar Bear Pitching will even see entrepreneurs pitch business start-up ideas while standing waist-deep in a hole cut through the frozen Baltic Sea. Bizarrely, they will be lit up in green as they pitch. 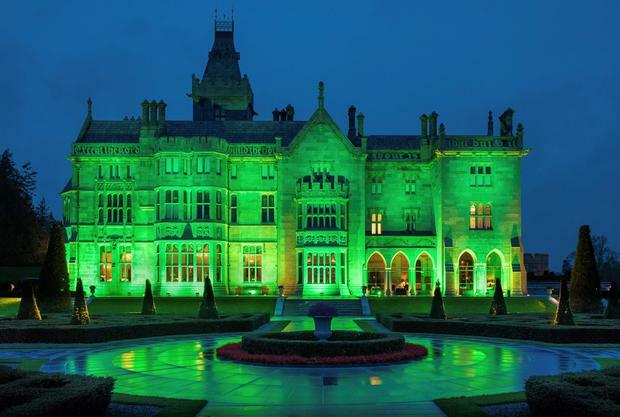 Nor is it just overseas landmarks – Adare Manor is wearing green, and Dublin Airport is rolling out 2.5km of temporary cabling to light up its campus. “Eleven separate areas are going green, including Terminal 1 and 2 and the airports iconic original 1940s passenger terminal,” said spokesperson Paul OKane. The Global Greening began life in 2010, when local diplomatic staff helped convince Sydney Opera House and Auckland's Sky Tower to "go green". Though Irish tourism is booming today, with more than ten million overseas visitors recorded last year, it was a different story when the project sparked up. "2010 was a very emotional time for Ireland, with the Troika and bank bailouts and all of that, and the initiative had a very emotional appeal," Gibbons recalls. 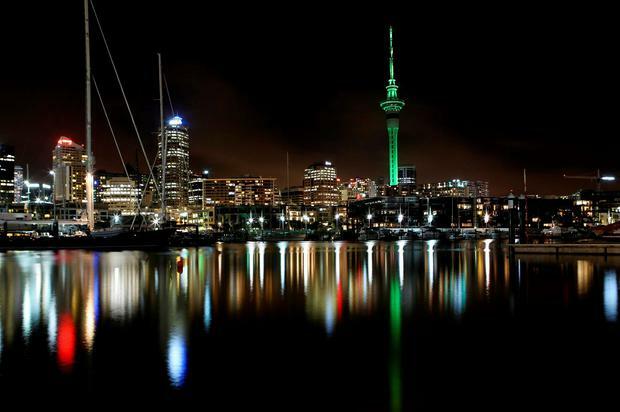 The Sky Tower in Auckland, New Zealand, joins Tourism Irelands Global Greening, to celebrate the island of Ireland and St Patrick. "St. Patrick's Day is undoubtedly the most celebrated national day across the world," adds Rodney Walshe, a former Irish Honorary Consul to New Zealand. Walshe helped convince the Sky Tower to go green… sweetening the deal with a gift of two bottles of Bushmill's Whiskey. "As the sun sets on St Patrick's Day, it's the end of the day in New Zealand and [the Greening] goes around the world from there," he says. With some 70 million people claiming some kind of Irish ancestry, he also believes the initiative deepens links with the diaspora. "It's a symbol of Ireland," he says. "People or their parents may have emigrated, and suddenly there it is on St Patrick's Day – the green of Ireland and it's for everybody to join in. "When you've lived half a world away and you see that green, you feel it… it's indescribable…. your chin goes up and your chest goes out." "There's no other country in the world that can do that." "There's a soft power to it," agrees Niall Gibbons, batting away the suggestion that St Patrick's Day PR comes on the back of unsubtle green stereotypes. The Global Greening – which Tourism Ireland aims to grow to 600 sites by 2025 – targets landmarks that reflect both traditional and modern heritage, he says. "It brings Ireland to life in a digital era."